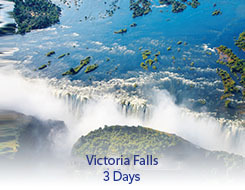 Victoria Falls is a spectacular sight of awe-inspiring beauty and grandeur located on the Zambezi River. There are many optional activities offered such as a scenic flight over the falls, visit to a local village, canoeing and fishing on the Zambezi River. Game drives are also on offer in the nearby Zambezi National Park or to Botswana's Chobe National Park. For the adrenaline seekers, there's a zip line, gorge swing, abseiling, white water rafting and bungee jumping.